Help! I’ve put the wrong fuel in my car. What should I do? Firstly, don’t start the engine. Secondly, call Fuel Fixer! Our call personnel will be able to assist you with professional advice on what to do next. This will depend on how much wrong fuel you have put in the car, what type of car it is and the age of the vehicle. In most cases it will unfortunately be necessary to have the wrong fuel drained out and replaced with clean, fresh fuel (although not in all cases). 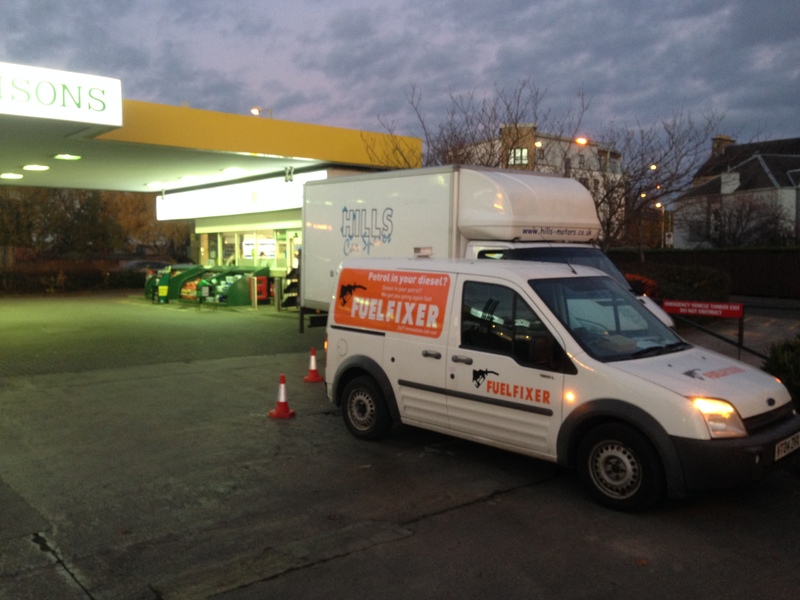 This will require having one of our mobile fuel drain technicians out to attend the vehicle. The procedure of emptying out contaminated fuel from a vehicle that has not been started is relatively simple. On the majority of models we will simply use our specialist equipment to access the tank via the filler neck. Unfortunately there are some vehicles which have a “saddle-tank” (most rear-wheel drives and 4X4s) which will require that the tank is accessed via the back seat of the vehicle. There are even some vehicles where access to the tank is almost impossible without removing it entirely. These will mostly be drained by pulling the fuel out from the front of the vehicle. If you have started the car, or tried to start it and failed, then we will need to also clear the entire fuel system of contaminats. We will flush the fuel lines, filter, injectors and pumps with fresh fuel to purge all the wrong fuel from the system. All our engineers are trained on the latest makes and models. We operate 24 hours a day and 7 days a week for your convenience. And we can come to you so there is no need to waste time or money having the vehicle recovered or towed. Depending on the volume of fuel in the tank and whether the engine has been run on the wrong fuel or not an average fuel drain can take between 30 and 60 minutes to complete. We aim to have all our customers on the road again within an hour of our arrival on scene. If you have any questions or need a fuel drain give us a call now or have a look over our FAQs. We’re friendly and like to help. So, if you are saying to yourself, “Help! I’ve put the wrong fuel in my car!” give Fuel Fixer a call. Thanks for the quick response. BP Ultimate it is then. I’ve reset the tachometer to zero and aim to top up every 50 or so miles over the next week or two, which should give plenty of dilution. I’ll also look into whether cleaning the fuel filter is a DIY job or not. Thanks again. I’ve found your website very interesting and honest. I’ve decided to risk putting 2.5 litres of petrol into the 58 litre tank of a Diesel Zafira. Everything seems Ok so far (25 miles later), touch wood, after keeping the tank as full as possible to dilute the petrol. In several threads you mention adding a diesel additive, do you recommend a particular brand? You also mention 2 stroke as an alternative, what concentration would you suggest. To make life simpler you could simply use the higher quality diesel (VPower or Ultimate, etc) bacause they already have additive mixed into them. Failing that pretty much anything you find in the petrol station – as long as it says that it helps relubricate the fuel system, not just clean out the engine. As an additional control, due to the fact that a lot of gunk can get dislodged by the “cleaning” action of the petrol, I would have the fuel filter replaced as soon as possible. To answer your question about the 2-stroke; I haven’t yet done the experiment personally. I know that it will help with lubrication – for sure – but we don’t yet know if there are any knock-on effects of burning it, such as fouling up the cat, etc. I would only try this if you are feeling very experimental and willing to take out and clean exhaust parts if needed. “It’s a good question, but something that hasn’t really been officially responded to by the engine makers. While it will no doubt help to lubricate the inner workings of the fuel system there is the inevitable question of what it does during and after the ignition phase. “There was a lubricity test done (well documented on the internet) which showed that 1:200 2 Stroke Oil to additive-free ULSD (ultra-low sulphur diesel) brought the lubricity of the diesel up to the acceptable motor-trade standard, but they didn’t test its after-effects on the combustion and exhaust systems. “If you want to try it out I would suggest going for mineral or semi-synthetic JASO FC or better JASO FD 2-Stroke Oil (not FA or FB). These are much less likely to leave a deposit to foul up your emission sensors or DPF. Also, keep an eye on your filter just in case adding it dislodges any carbon deposits in the fuel system which go on to clog the filter. “A lot of people say that using this as an additive every time they fill up increases their /mpg and reduces smoke and noise. A lot of other people say it made absolutely no difference and that any improvement noticed was purely placebo-like. Very, very few have gone on to mention any sort of problems arising from adding it. “While the science behind why it works seems logical, I personally haven’t tried it and so can’t give any evidence to support either argument. I might get a bit experimental one day and give it a swing.